This greenhouse program is intended for informational use only. For the best possible results tailored to meet your needs and soil type, check with your AgPro™ representative for specific recommendations. Mix 2 to 4 ounces of GREENHOUSE BLEND per gallon of water. Mix and water as usual. Apply once per month or when transplanting. To stimulate micro organisms and assist air and water transfer. 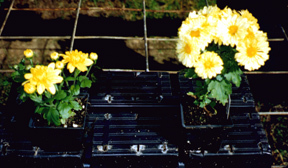 Often potting soil can get hard or crust over. Wetting agents soften soil, and the enzyme base stimulates rapid growth in beneficial bacteria and micro organism for better soil/root exchange. 2 ounces of RENEW (preferred) or 4 ounces of GREENHOUSE BLEND in one gallon of water. Soak cuttings and plant in a good potting mix. Pour excess over plants. Stimulate root development Stimulants signal plant to create new root growth. Enzymes create environment in soil life that release nutrients easily to newly forming roots. Note about Spraying:We strongly recommend using an adjuvant with your greenhouse spray program. AgPro™ specialty surfactants (SS 9,SPREADER STICKER, phLAME) have proven cost effective with spray applications of chemicals (fungicides, herbicides, pesticides) to allow lowest label rates with better results. The synergy can add potency and extend the chemical life and have allowed some growers to experiment and get exceptional results with well under label rates.